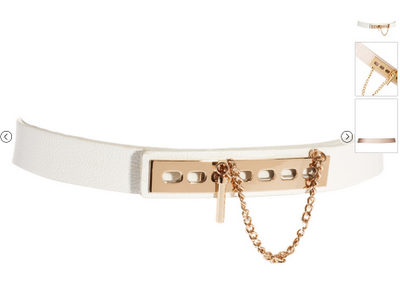 In the mood of spring, I picked up this white belt with gold chain details recently from ASOS. Similar styles had been pretty popular with high fashion labels such as BCBG. I found the design on ASOS as I was browsing their selection when this one caught my eye. There was a green one as well. The belt was not on sale, but I had a 15% off spring coupon code so it was a good deal! I believe I paid only 15+ USD for it. There was a green and pink one as well, but I decided that white is much more versatile and easier to match. I've already set my mind on pairing the belt with my pink thrifted chiffon top (previously featured in my DIY metal collar tips post). 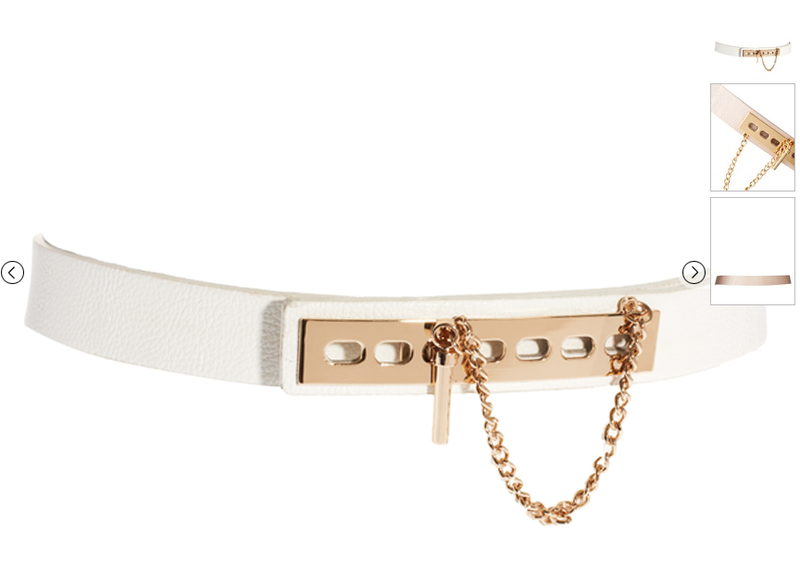 The exact name of the belt is ASOS Link & Plate Detail Belt, with sizes in S, M and L (32, 34 and 36 inches respectively). I got the belt in Small as the ASOS sizes tend to run a bit large. It was a tad snug, so I actually did some altering myself. I removed the screws of the buckle and adjusted it. To reattach the buckle, I punched more holes with my leather hole punch. The original screw holes are covered by the metal plate so it is invisible when worn. These are the times when my DIY skills and technical abilities from work come in handy! Overall, it's a very versatile design and can definitely last through the spring and summer season. Can't wait to wear it out! I've been a fan of ASOS house-brand belts as they are decently durable and very affordable. The shipping is free too, for normal airmail. Since it wasn't an extremely pricey item, I opted for the free postage and it took 2 weeks to arrive. I've tried the express mail service with full tracking and that took about 3 days for my package to arrive. The express shipping was very expensive too, so if the item is not extremely important, urgent or expensive opting for the free normal postage is reasonable. That's a nice belt with versatility and style all packed together!